Open source Java library for managing SWIFT messages. Active since 2006, production ready and commercially supported. Complementary Java library providing additional API on top of the Open Source. Full-stack application, with a ready to use SWIFT dashboard; built on top of the Integrator. We help you design, implement and maintain your required SWIFT applications on top of our framework. We offer you deep expertise gained from hands-on experiences working for financial institutions around the world. You won't have to teach us about your financial services. We use established techniques and tools in a pragmatic approach, to achieve an optimal balance between urgent and important. Highly experienced research consultants will analyze your requirements to offer you the best solution options. When doing the right things is not enough, innovation, or doing something new, is fundamental. Sometimes, imagination is more important than knowledge. Support designed to your needs, covering both the open source and the commercial products. Software defects analysis, debugging and development of resolution code. This may involve a fix on the libraries or a specific workaround for the customer. Remote installation assistance for libraries updates and upgrades. API usage analysis and code review. Guaranteed SWIFT Standards compatibility and upgrades when necessary. SWIFT annual standard release updates (SRU) 6 months before going LIVE. Dedicated Technical Account Manager. Pro-Active consulting and expert guidance. Get best practices recommendations pertaining to your environment from your Technical Account manager, who has an in-depth knowledge of your PROWIDE environment(s) based on initial discovery and ongoing support history. Optional * early release to receive for SWIFT annual standard release updates (SRU) 6 months before going LIVE. Everything in the Basic support plan. Included early release subscription to receive SWIFT annual standard release updates (SRU) 6 months before going LIVE. Everything in the Premium support plan. * The Early Release is an optional subscription to receive the new SRU updates, each year, by May. That is 6 months before the SWIFT live date, and 5 months before the public releases of Prowide Core. The Basic support plan and the Early Release are included in all commercial products. The scope of the Core support packages is the open source library. 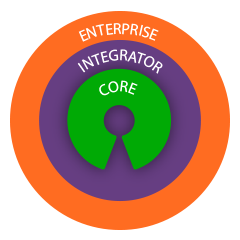 If you have a license for any module in the Integrator or Enterprise packages, support for Integrator/Enterprise gets you covered for both the open source and the licensed software. Access to open source and PROWIDE expert consultants. Ensure consistent uptime for critical applications containing PROWIDE components. Contact directly with the development community. Provides customers high levels of pro-active support and personalized incident and crisis management. Availability to customize the support package by selecting block hours linked to customer needs. We offer on-demand and customized training activities. Contact us to design and facilitate an event or course based on your needs and requirements. Looking to begin early on with testing the new SRU (SWIFT Standard Release)? Then subscribe to the early release update and begin testing already by the end of May, each year. Don't wait for the public release in October and save 5 months of waiting time. Whatever your processing volume, we offer you a secure choice to meet your specific SWIFT integration needs. © 2019 Prowide. All rights reserved. Prowide Enterprise 8.0 including the REST API and revamped GUI has been released for customers.